Headband hair extensions are a great way to complement your natural look, try a new style or glam up for a party or special occasion. They can also be perfect for fancy-dress. The use of hair extensions by women and girls to reflect fashion trends and enhance beauty originates back to ancient Egyptian times and the iconic Cleopatra. 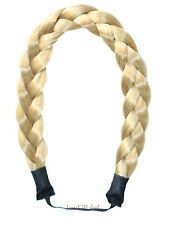 Modern headband hair extensions are relatively quick and easy to apply. You can fit them yourself saving the time and cost of professional styling. Hair pieces are light weight, comfortable to wear and can be securely attached minimising interference with movement or activity. Most headband extensions don't require glue or tape but can be easily fitted, using hidden wire or elastic wefts or slip-on headbands that can be discreetly weaved into, or covered over by your natural hair. Whether you want to add length, volume or layers, enhance your colour or create waves or curls – there are a variety of hair bundles to help you to achieve this. You can choose from half or full-head extensions, real human hair or different kinds of synthetic fibres, at a range of prices. There are an assortment of colours and shades available across the classic brown, black, blonde and auburn colour spectrum to ensure natural blending with your hair. 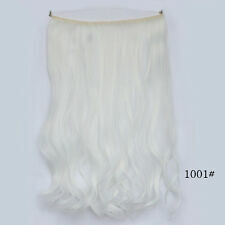 Alternatively, you can opt for two-tone or mixed colour extensions, as well as fashion colours such as pink and blue. If you want to create a specific up-do style but don't have the hair-length or prep time to do so, there are plenty of ready-made pieces available. Choice ranges from the classic bun or traditional ponytail, to more recent trends such as the popular halo plait, fish tail or blunt-cut fringe. Most extensions can be blow-dried, coloured or trimmed to help complement your natural hair. Carefully hand wash them and you'll be able to use them time and again.